Tahir Square, Puerta del Sol, Syntagma Square, Wall Street…Cairo, Madrid, Athens, New York…as many cities, as many places where different nations started camping to take the streets over, take public spaces back, take democracy back. This documentary tells the story of a movement that first took place on the banks of the Nile to spread across the world and try to change democratic interactions. 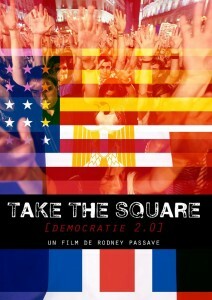 The movie Take the Square was shot in 2011, covering the various social movements (Arab Spring, Occupy Wall Street, Indignados…) which unsettled the planet. Watch the trailer here. Click here to donate. The money won’t be debited unless the goal (6000 €) is reached by March 2013. In case of failure, your money will be given back to you. Thank you for sharing the information among your contacts and, for those who can financially help, see you on touscoprod.com. You can use this tutorial. For more information, you can email us here: takethesquarethemovie@gmail.com. Follow our updates on our blog or on the project’s Facebook page. Trailer for your Spanish-speaking friends.